Whether outdoors or at the gym, listening to music or even an audio book while you run helps keep you motivated and energized. Whatever you like to listen to, you'll want earphones that are designed to stay securely in your ear while you move and can stand up to the wear and tear of sweat and exercise. I looked at nearly a dozen of the top rated earphones made for sports & exercise and found the three best earphones for running. The Bose SoundSport Sport Headphones have a special hydrophobic cloth that keeps out sweat, weather and dirt without affecting the sound. It's important for any earphones or headphones designed for running to stay in place while you move, you don't want to be constantly adjusting them. For a good fit, Bose gave the SoundSport's soft fins which grip the inside of your ear to keep them comfortably in place even during vigorous movement.The fins come in three different sizes to fit any ear. In a word, they sound great. Good sound isolation blocks outside noise and the drivers provide a well balanced sound of crisp highs and good bass. If you're looking for really deep bass like many headphones are tuned for these days, these might not have enough base for you, they have a more neutral tone. In addition to Energy Green pictured above, the Bose SoundSports come in Charcoal, Frost, Neon Blue, and Power Red. These Sennheisers cost about half of what the Bose earphones cost but still giving you good sound with a durable design that can stand up to sweat, weather and extra wear and tear. 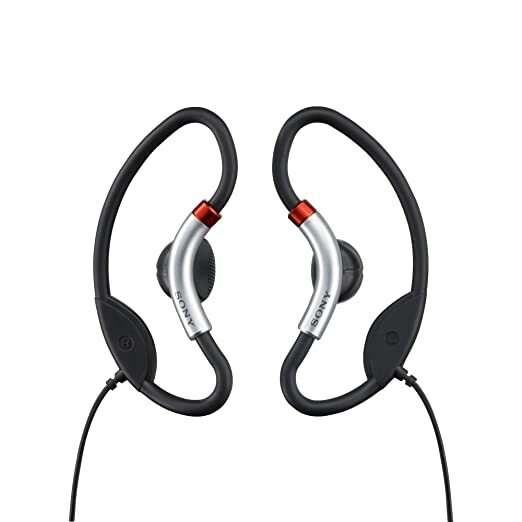 Like the BoseSIE2, the Sennheiser's have a soft tip that comfortably grips the inside of your ear to keep them secure while you exercise. The cable and headphone jack are reinforced so they can take extra abuse. They have a good level of isolation to block out unwanted noise and deliver very good sound across their entire frequency range. While the Bose earphones sounded better, these Sennheiser were great for the price. No matter what you listen to, it will sound good on these earphones. Included is three different tip sizes for a good fit, a cable clip to keep the cable secured to your clothes, a storage pouch and a cleaning tool. These are great mid-priced choice. If you're running on busy streets for example, it might be dangerous to not hear what's going on around you. These Sony's don't isolate your ear canal so they allow external sounds to be heard while stilldelivering a really good sound with excellent bass at an exceptional price. Soft loops wrap around the back of your ear to keep these headphones securely in place and are comfortable even for extended wear. If you don't like the feeling of earphones that seal off your ear canal or grip to the inside of your ear, you'll love these. A sweat-resistant moisture guard allows moisture to pass around the headphones to keep them safe from sweat damage and a clip lets you secure the cord to your clothes. If you want your music to sound great while you run or workout but still want to hear what's going on around you, these Sony's are your best choice.